The Palace at Galatas is a Minoan archaeological site 27km south of Heraklion city. It is located near the villages of Galatas and Arkalochori with fine views of the surrounding countryside. It was discovered and excavated in 1992. In 1997 the archaeologist responsible, George Rethemiotakis, announced that the main building had all the characteristics of a minoan palace which was built only in one period, the neopalatial. Excavations were completed in 2005 although they continue in buildings outside the palace itself. The large, central courtyard of the palace was originally surrounded by a four-wing building. The East Wing is the best preserved part of the building, while the West and South wings have been extensively damaged. The north wing has now also been excavated. Excavations in the East wing brought to light grinders and hundreds of drinking vessels, which suggested that feasting ceremonies took place. 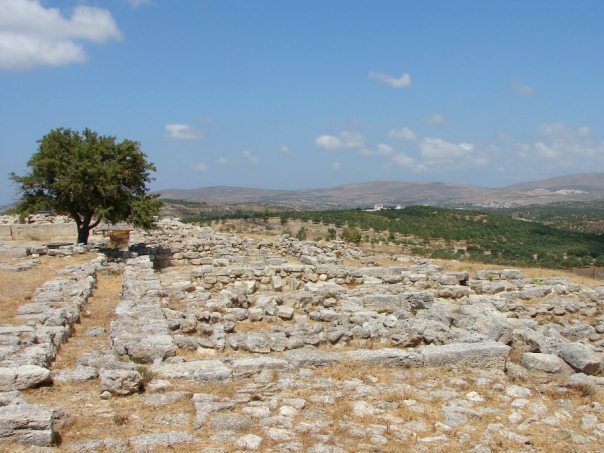 For the first time in Minoan Crete, a hearth was discovered together with a layer of ash in one of the rooms. The Palace flourished during 1640 BC but was destroyed by earthquakes and abandoned around 1500 BC.